Getting a 99 percentile score on either of Verbal and Quant sections on the GRE requires several weeks, if not months, of diligence, patience, practice, and smart prep. But with only a fraction of the hard work you put in for Math and Verbal, and just a few days of practice, you can easily get a 99 percentile score on the AWA section. Plus, getting a 6.0 on the AWA isn’t a regular occurrence, and only about 8000 test takers around the world do it every year. So, if you can be one of those guys, you will be famous not only among your friends, but also among the admissions committees. Unfortunately, the AWA is the most neglected section on the GRE. Test takers across the world believe that they can easily master AWA in a day or two. And look at what they end up with: The average AWA score of a GRE test taker worldwide is a mere 4.0, and the average AWA score of an Indian test taker is even lower. Now, to most Indian students, getting a 4.0 on the AWA might seem like an impressive feat. But in reality, 4.0 is considered just average in most countries. And on top of it, getting a 6.0 isn’t really as tough as it seems. It is only that you don’t know how. If you are looking to score a perfect 6.0 on the AWA section, you will have to be a lot more planned than most other students. Just as with the Verbal and Quant sections, mastering the essay section on the GRE requires the same amount of confidence, persistence, and practice. And in addition to all that, you will also need a solid guide that can help you with all the strategies and tips. You will need an AWA Bible, so to speak. But sadly enough, there isn’t much useful information on the internet about this frequently neglected section. Yes, there are some good articles and sample 6.0 essays that you can get with a simple Google search, but nowhere on the internet is a definitive guide to help you write a 6.0 essay on the GRE. And that is why, we at CrunchPrep, decided to provide you with a complete, advanced guide to scoring a perfect 6.0 on the AWA. And hey, don’t blame us if the 6.0 percentile goes down from 99 to 80 soon. What is the AWA all about? The Analytical Writing Assessment (AWA) portion of the GRE consists of two essays, each of which you will need to write in 30 minutes or less. The two essays you will see on the GRE are, Analysis of an Issue and Analysis of an Argument. These two essays will always come first on your GRE test, no matter what. You cannot simply skip off AWA, move on to the other sections, and come back later. AWA itself is a separate section, and only after you finish writing the two essays can you move on further. Despite what most students say, you should remember that the AWA only tests how well you can write an essay, and hence measures only your writing abilities. Contrary to popular opinion, the AWA does not analyze your thought process. As long as your essay sounds logical, writing ability is all it measures. We will be discussing more about this in the upcoming sections. How important is the AWA? It is a widely known fact that your AWA essay score is not as important as your composite math and verbal score on the GRE, and getting a 5.0 or 6.0 won’t make or break your chances of getting admitted to the university of your choice. Graduate school admissions officers only bother about your AWA score, if it is too low, or significantly lower than their usual class average. Yes, a poor score on the AWA can definitely send up a red flag, and the admissions committee will certainly think twice before letting you in. Sometimes, they even go to the extent of rereading your SOP and LORs, to find out if they were actually written by you or someone else. So, it is rather safe to say that the AWA score is an important enough factor when it comes to admissions. What is the score range for AWA? Clearly identifies and analyzes the most important features of the argument with deep insight. Develops cogent ideas, organizes them logically, and connects them properly without sudden transitions. Supports the main points of the critique strongly. Demonstrates superior control of the English language, including diction, sentence formation, spelling, grammar and syntactic variety used in standard written English. Few to no flaws in the essay. Clearly identifies the important features of the argument and analyzes them thoughtfully. Develops ideas clearly, and connects them logically, with appropriate transitions. Gives a very sensible support to the main points of the critique. May have minor flaws like spelling errors, but no major flaws. Capable of Identifying and analyzing the main features of the argument. Develops and organizes ideas satisfactorily, but some important connections and transitions may be missing. Supports the main points of the critique. Demonstrates sufficient control of language, but may lack syntactic variety. May have many minor flaws or some major flaws. Does not identify or analyze many of the important features of the argument. Has limited logical development and no proper organization of ideas. Demonstrates no understanding of the main features of the argument. Almost no analyses of the main points have been made. Provides nil to few relevant evidences. Has frequent serious problems in the use of language, grammar, spelling, and sentence structure. Provides little to no evidence of the ability to understand and analyze the main idea. Failure to develop an organized response. Has an unusually frequent pattern of errors in grammar, usage, and logic. The responses are off topic. The responses are written in a language other than English. The responses are a mere copy of the given topic. The responses consist only of random keystroke characters. So, it is safe to say that if you write at least a few sentences in English, you will get a score of 1.0. But rest assured, no university under the sun will accept a score that low. How is the AWA graded? What do graders look for in your AWA essays? 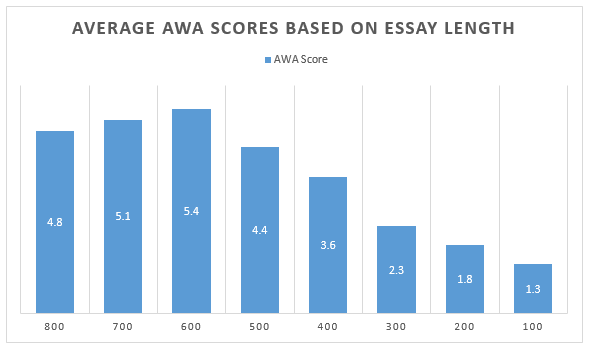 Most students think that essay length the only important factor when it comes to AWA scoring. But, in reality, it is not. Of course, it is one of the most important factors, but it isn’t the only factor. You will have to take many other factors into consideration, if you are looking to get anywhere near the perfect score. We have complied a list of all the factors that affect your overall AWA score, so you can be well prepared, while improving your writing skills on those lines. This is the most important, and also the most fundamental of all factors that the graders judge your essays on. The grader should understand what you are trying to say, by reading once. This makes their job easier, and they will understand that if it can be understood with just a single reading, then your essay has clarity. As we discussed earlier, the grader can spend a maximum of only two minutes per essay, and it is your duty to make sure your essays have clearly composed ideas, because more often than not, graders do not bother to reread your essay and waste another couple of minutes. Consequently, you will end up with a score much lower than what you actually deserve. Ask yourselves these two questions when you are writing the essays. What are you trying to say? What’s your main point? These two questions must have solid answers by the time the grader finishes reading the essay. If you think about it, these are the exact same questions you will have to answer, during Reading Comprehension. Just like how you can easily solve a Reading Comprehension question if you have answers to those two questions, graders assessing your essay will also need to find answers to these exact same questions, if you need a perfect score. Substance matters more than any other factor when it comes to your essays. So, make sure you have solid points, and clear logical reasoning that can be easily understood. You should have seen it coming; structure is the second most important factor on your essays. The way an article is formatted, has a massive impact upon its readability. Your essays should read like a story; something that can be easily understood, and something that has a proper structure and organization. So, it is important that you break up your essay into distinct paragraphs, each with its own meaning and context, while maintaining a smooth transition between one paragraph and the next. This way, every paragraph reads like a separate story, and the essay graders can easily scan through your entire response easily. Plus, since the transitions are smooth, and there aren’t any sudden twists in your response, it will make the grader’s job a whole lot easier. So, ideally, you should have a structure in mind before you begin writing the essay. The general structure is to start with an introductory paragraph followed by 3-4 body paragraphs and finish off with a conclusion paragraph. So, you should make sure that there are at least 5-6 paragraphs in your essay, if you want a solid score on the AWA. Even though you are writing several paragraphs on the same topic, you should ideally avoid writing similar or same sentences. If you are an avid reader of news, you get the point. No good writer under the sun writes two exactly same sentences in a single essay or article. Consecutive sentences with the same structure and length can sound monotonous and lifeless, and will obviously bore the reader. Instead of sounding repetitive and boring, use sentence style skillfully. But this doesn’t mean you should rearrange the words, or chance the voice from passive to active or vice versa. It simply means that you should use a different variety of words to mean the same thing. For example, if you have already written the sentence ‘The most important virtue of a leader is a strong sense of ethics.’, and if you have to use the same sentence at a later point in the essay, you should try and rephrase that same sentence and write something like this: ‘A strong moral framework is paramount for any leader.’ Get the point? In this way, you should keep varying the sentence structures, flow and rhythm by switching between short and long sentences. You should also make use of transitional and signal words to vary sentence openings and endings. There has been a longstanding myth among test takers that the GRE really loves heavy vocabulary, and using it on your AWA essays will boost your score. Well, this isn’t true at all. We have seen students with exceptional vocabulary but poor coherence get paltry AWA scores in the past. And we have seen students with great essay scores without using heavy vocabulary. Like we said earlier, the AWA is not testing how much vocab you have in your arsenal. There’s Sentence Equivalence and Text Completion for that. AWA only tests how logically you can deduce information and write a reasonable critique about an issue or an argument made by someone else. So, don’t buy those myths. As long as you use sensible reasoning, proper grammar and as long as you can defend your point intelligently and use precise vocabulary to convey meaning effectively, you should be alright. It is not needed that you use heavy vocabulary or GRE words. Though officially ETS says you may have minor errors in the essay copy, that doesn’t mean you can ignore silly mistakes. Even though the mistakes or errors do not interfere with overall meaning and coherence, you should understand that the time you make your first error on the essay, the grader will notice it, and will be more conscious while reading the rest of the copy. The grader will be even more vigilant to see if there are any visible or obvious blunders that you have made, and this can have a negative impact on your AWA score. So, try and make sure your essay is as spotless as possible, and eliminate all errors before submitting. Take time to proofread your essay, once you finish writing it. Don’t be in a hurry to submit it off and skip to the next section. Reasoning plays a key role in determining the overall quality of your essay. You should always look to include as many logically compelling reasons as you can to support your stance. One of the most important features about a compelling essay is its ability to convince the reader by means of sound logical reasoning. Anyone who reads your response should be totally convinced of your view point, without having second thoughts. To be able to write such a compelling and well-reasoned copy within 30 minutes would be rather difficult, but you can definitely do it with a lot of practice. So ideally, you should be able to connect your ideas properly to the central theme or idea of the essay, and convince the reader to agree to your point of view. If the essay doesn’t sound logical or reasonable, you will unfortunately have to pay the penalty, no matter how long the essay is. In order to make your essay sound reasonable and logically sound, you will obviously need to provide sufficient evidences. If you want to impress the readers, and convince them to agree to your point of view, you will ideally want to provide convincing evidence to back up your thesis. Search for evidences, either direct or implied, and connect them with the essay. You can even create some random examples and evidences, as long as they fit the bill and don’t sound too random. Develop examples that cogently reinforce your thesis is key to a high essay score. So, those are the 7 most important elements that graders look for in your essays. Make sure you have all these things covered in your essay, and you’re sure to see a perfect score. Should you skip the AWA section during practice? This is probably a question that is on the minds of many students. Almost half of the GRE test takers are native English speakers. And these students tend to neglect practicing the AWA section at home, because according to them, it’s not worth investing time on something they are very confident about. But, there are a few vital points that they don’t realize. We’ve observed what students do when they practice for the GRE, how their approaches have affected their scores on test day, and figured out four reasons as to why the AWA section is an extremely important aspect of the GRE exam. This is the single most important thing to consider when we talk about the importance of the essay section. Students normally tend to skip the essay section when they take practice tests, so they can directly go to the first section of Math/Verbal. Though this might seem like the obvious choice to you, you should consider the aftereffects before jumping into conclusions. Think about it. The GRE is not a typical test that you encounter at college or elsewhere. It is a marathon. An intense, 3 hour 45 minute journey, which obviously you aren’t accustomed to. Now, if you skip the essay section during practice, you’ll be forfeiting 60 minutes of the total test time, which means you are going to have to sit for 2 hours and 45 minutes only. This translates into an inflated overall score during practice, because you are just that much more active than you will be on test day. So, you get accustomed to sitting for 2 hours 45 minutes for the test, and your brain is hardwired to concentrate for that much time only. But, on test day, you still have two more sections to finish after you complete 2 hours and 45 minutes. Do you get the point? It’s that extra one hour of concentration that requires sudden attention from your brain, which it sadly isn’t ready for. This is exactly why thousands of students score very low on their last two to three sections. They simply aren’t ready for the extra time, because their brains feel tired already. So, if you don’t skip the essay during practice, you’ll be writing in the exact test conditions as on test day, thereby training your brain for the big encounter. There are a few other important reasons why you should not skip off AWA during practice, and we have discussed them separately. When closely observed, there is a significant increase in the number of words from a 5.0 graded essay and a 6.0 graded essay. The reality is, longer essay is usually better. To analyze further on this topic, we have done a bit of research, and found out an interesting relation between essay length and the final score. If you look at the statistics below, you will have to concur with me. Longer essays usually score better on every essay topic. The most fascinating thing about the GRE essay section is that each and every essay topic that shows up on the real test is already published on the official ETS website. This may sound crazy because giving out the questions in advance is totally unnatural. By knowing the topics beforehand, you can prepare sample responses for all those topics and on the test day, all you need to do is just reproduce your sample response. Isn’t that a great advantage for you? You can get a perfect 6.0 score very easily! But there’s a catch! You were expecting a few, aren’t you? Well, there are close to 200 topics in all – far too many to practice responses in advance. Also, practicing each of these topics is not advisable as it is going to take a lot of time and effort and there is no point in mugging them up. You could as well spend this time on learning some math or vocabulary. However, there’s a good news. Just scanning through these two lists of essay topics will give you an excellent idea of the types of issues and arguments that show up on test day. Now, most of the topics that show up on the GRE Essay section can be broadly grouped into five categories. I made things a bit easy for you and listed those five categories below. Take a look. So, next time when you practice writing an essay response, make sure you write at least an essay from each of these categories. How do I get ideas for the essay? This is most likely the second most frequently asked question in our support mails by students around the world. It’s because a large number of issue and argument prompts on the official essay pool are hard to understand correctly. And when you don’t understand something, how can you write about that something? If you were asked to write about a topic from out of nowhere, you would struggle for ideas. But when you already know that there could only be five categories from which your essay topics can show up, then you can turn the table in your favor. You should keep a few related examples for each one of these categories (i.e. education, arts, politics, technology, philosophy) as they will be handy and save you precious time on the test day. Also, the essay prompts are full of obscure vocabulary and hence are hard to comprehend. Since, every essay prompt that could appear on the GRE is openly accessible on the official ETS website, you should give them a read through. While reading, you should also make note of all the unfamiliar words and later learn them. Learning these new words will ensure that you understand the topic well or at least allow you to take a very good guess. How to get your essays graded? So, those are the five ways that you can get your AWA scores graded. Most often, more than one of the resources mentioned above will definitely be helpful to you. And by the way, remember this: Only two things can make you a better writer – Practice, and Feedback. The Analytical Writing Assessment (AWA) section of the GRE asks you to complete two separate but complimentary writing tasks: The Issue Essay and the Argument Essay. Each task tests your analytical writing skills, including the assessment of your critical thinking skills. Both these essay questions are allotted 30 minutes each and are scored on a scale of 6.0. And those are the only similarities between them both. There are lots of differences between these two types of AWA essays that a majority of test takers are unfortunately unaware of. It is common to think that since both these are essay questions, there aren’t many differences between them. And most of the errors that students commit in this section are due to the confusions that exist between these two essay types. GRE Issue Essay and GRE Argument Essay are very different in nature, and hence you need different strategies to tackle them. We will go deep into each of these essay questions you will see on the GRE, but for now, remember that the GRE Issue Essay requires you to construct and support your opinions on a particular ‘issue’ that has been given to you, whereas the GRE Argument Essay requires you to validate the authenticity, or the logical correctness of an argument that someone else has constructed, without letting your opinions interfere with the task. Got the difference? Now, let’s move on to the finer details. The GRE Issue Essay basically tests your ability to present an argument with your views, and your ability to convince the reader to agree to your point of view. As you can clearly see here, you should include your own views and add valuable points to your response, in order for the reader to be convinced to agree with you. On the other hand, the GRE Argument Essay requires you to completely analyze a brief argument written by another author, and to effectively critique the argument or the author’s point of view, by providing sufficient evidences, and by asking logical questions. In an Issue Essay, the debatable topic that has been given to you to analyze, is very general in nature and can be from any field. It hence doesn’t usually require you to have a very deep knowledge of the topic. The issue is simply provided as a statement, and your job is to pick a side, stick to it until the end without fiddling around, and present your points of view, your analysis, and your final conclusions in a suitable manner. However, in an Argument essay, the author himself already presents a case with his/her supporting evidences in the form of a paragraph. Your job is to see how logical the argument sounds, and check whether this argument is right or not, whether the argument has been made on solid grounds, with sufficient evidences or not. You should then effectively critique the argument, by choosing sides. If you choose to substantiate the author’s point of view, you can cite your own examples to strengthen the points, and if you wish to go against the given point of view, then you must be able to ask comprehensive questions that check the validity of the evidences provided in the argument. In an Issue Essay, remember that you must be able to introduce the issue at hand in your own words briefly, using your own conclusion, while in an Argument essay, the given argument must be introduced from the author’s point of view using his own conclusion. This is such an important difference between the two essays, and most students tend to do the opposite more often than not, which is why they end up with average scores. You should always be clear on whose conclusion you are taking into consideration: yours, or the authors. And this depends on whether it is an Issue Essay or an Argument Essay. The second paragraph in the Issue Essay is where you should be stating the side you have chosen, and also your reasons for standing by it. Whereas in an Argument Essay, the second paragraph begins with the biggest flaw that you have identified in the argument made by the author. You should also discuss how his conclusion made by the author overlooks this major flaw. The flaws in the author’s presented argument must be identified before you start writing your response, which makes it easy for you while critiquing the argument. In the Issue Essay, the body paragraphs (paragraphs 2, 3, and 4) must definitely involve relevant real world examples that support your chosen claim. Remember that the examples you provide must not only be relevant, but they must be real world, true examples. Which means, you cannot create examples out of thin air, on your own. But, in an Argument essay, you have the flexibility to create your own examples, as long as they are relevant to the given topic, and as long as they efficiently substantiate the argument that you are trying to make. The flaws made by the author that you have identified, must be stated with explanations and solid examples, which can sometimes be fake, as long as they fit the scenario you are trying to explain. The conclusion statement in an Issue Essay always involves agreeing with the opposing viewpoint in one or two statements. Even though you might not like agreeing with the opposing viewpoint, you should mention that it can be right in a few instances too. You should do this in order to show your emotional maturity level. But, in an Argument essay, the conclusion statements ends on a note of doubt, where you claim that the argument may have one or more valid points but is otherwise entirely flawed, needs more plausible explanations, and requires more solid examples for it to be valid. Agreeing to the point of view given in the Issue Essay gives you more points to write, since more often than not, the issue presented to you is a general topic, and there will be few points to go against, while there will be plenty of points to support the given claim in the issue. But we still advise students to go the negative route. We will discuss this later on. But the scenario is entirely different when it comes to the Argument Essay. The Argument given is deliberately made to sound negative, and since the given argument requires a critical analysis of the presented claims rather than your own perspectives, you can, and hence should, go against the author’s point of view. Since more often than not the author’s point of view will be flawed, you will have lots of points to write, and it becomes easier for you to attack the author’s argument instead of trying to support it. A very important point you should remember is that in an Argument Essay, you should only prove that the evidences supporting the conclusion are inadequate, not that the conclusion itself is wrong. The conclusion is always right, but you should doubt or question the authenticity of the conclusion, meaning, ask how the author came to such a conclusion without sufficient supporting claims. But it is never wise to say that the conclusion itself is wrong, so you should rather limit yourself to saying that the conclusion needs more evidences. On the other hand, in an Issue essay you have the liberty use anything and everything to support your claim. Because the topic given is very general in nature, you may use any evidences to support your statements, even if they say that the conclusion is wrong. The Issue Essay depends on outside, credible facts, because there are no evidences provided within the issue. The issue question is a simple, generalized statement, and there will be no evidences provided. Which is why you should go search for your own evidences, and decide if you want to support or question the conclusion made by the author. But the Argument Essay already has its own evidences provided within the paragraphs, which you will have to analyze and critique. The Issue Essay is always like a two sided coin, presented as a contestable topic with two sides where you have the option to go with the side you can present best. The Argument Essay however does not have two sides for you to choose. It has only one claim which must be analyzed and critiqued. In the GRE, AWA Section is very important as it shows off your communication skills and writing abilities. Looking out for these common differences between the Issue Essay and the Argument Essay, will help you avoid mistakes and prevent misconceptions. A better understanding of these differences and sufficient practice will help you score high in this section. The graders are there to assess your essay holistically. Which means, they are gauging its overall effectiveness, and then assessing it, as humans. But how do they gauge effectiveness? Are there any metrics that usually have in mind while going through the essays? Yes. Fortunately, there are 7 major factors that that may stand out to a grader and help influence your overall AWA score. Organization is given the foremost importance by many graders. And it isn’t that hard to understand why. Essays that are well organized are, in fact, easy to read. That’s important because you don’t want to make the grader’s job any more difficult than it already is. The grader has only a couple of minutes to read your entire essay, and poorly organized essays are hard to follow. This will lead the grader to give you a score lower than you actually deserve. But on the other hand, a well-organized argument is easy to follow. Since the graders are looking at your analytical abilities, it helps if they can follow your argument. If you organization is unclear, however, then your argument is also likely to come across as unclear. In the next chapters, we will be discussing more about how your essay should be organized in order to get a high score. Syntactical variety is a very key aspect of writing quality content. Your essays should always have a proper syntax, and you should be using a variety of sentences to make your writing look professional enough to get a perfect score. Syntax is a fancy word for how you organize words into sentences. And you already know how important organization is. You should always try to write clear sentences that are crisp and easy to understand. Unlike what most students believe, you don’t have to use extensive vocabulary, unless they really fit into the scenario. So, save the GRE vocabulary for Text Completion, and write your essays simply yet creatively. Again, you should remember that your grader has to read hundreds of essays on the same day, and they sometimes will not be thrilled to untangle a complex sentence that you have used. So, they naturally skip that sentence and read further. So, it is always better to write clearly and simply than to go for risky propositions and complex sentence structures. A general finding is that longer essays tend to score higher than their shorter counterparts. This may be attributed to various obvious reasons. First of all, if you have written a pretty long essay, it means that you have a lot of insight into the given topic and you are able to address numerous issues relevant to the discussion. Second, if you can write a 500 word essay coherently within 30 minutes, you will be considered as a voracious writer in general. These are the abilities that are usually likely to impress a grader. But, make sure that the quality of the essay is maintained throughout the length and breadth of your essay, for, if you don’t maintain quality, you might come off as someone who is just trying to impress but is unable to organize and prioritize their thoughts. Long essays that are clearly organized, use professional language, and contain strong supporting evidences, and give enough reasons to the grader to give you a better score. We’ll soon discuss more on this. Your essay response should definitely contain quality instances of premises, facts or reasons given to support the conclusion that you are trying to make. Your essay needs to contain some sort of supporting evidence, whether it be logical, statistical, factual, or other forms of justifications. Without proper support, your essay will not be able to effectively develop a firm position on the given argument or issue, and it certainly fails to persuade the reader’s opinion. So, make sure you always look for supporting evidences, and provide them wherever needed. Like discussed erstwhile, you’re going to have to come up with a lot of examples that help illustrate the point you’re trying to prove, if you want to make your essay stand apart from the rest of the pack. Since test takers have a mere 30 minutes to write these essays and will never know the topic beforehand, the graders are used to seeing a lot of hypothetical examples. And this is completely okay. As long as you make sure that the examples fit the point you are trying to explain, it is completely fine. But the way to make your essay stand out is to use real life examples. I know it is very difficult, but if you are lucky enough to have some background about the given topic, you should try to include an expert opinion within the essay, and if you can, you should try and add relevant facts, statistics, and case studies to your essay. Although the AWA does not test your grammar skills and the caliber of your writing, if your essay has a lot of grammar errors and spelling errors, it raises a serious red flag in the mind of the graders. This often happens because students tend to think that they can outsmart the grader by using fancy sounding words once in a while. While doing this doesn’t hurt, it is important to remember that you should only use words you actually know. Sometimes, students might not know the exact meaning, or even worse, the spelling of a big word that they heard somewhere, but they still go ahead and use it in a sentence. And obviously, they will be wrong, one way or the other. Now, while spelling is not one of the criteria the graders look for in your essay, nothing gives them a red flag like reading “Sevaral entreprenuers” or “primery hypothesys”. These are regular words used every day, and if you cannot spell them right, your score is bound to go down. Remember that unlike MS Word or other desktop word processors, there is no spell check or grammar check available on the GRE AWA. So, don’t hurt your score by using words whose spellings you don’t know. The word processor on the GRE is quite basic in nature. You’ll have basic keyboard functions, plus three other features: cut, copy, paste, and undo. And that’s all. No other shortcuts or spell checks or other advanced features like bold and underline. Now, these functions work exactly as they do on your computer. You can cut text from a portion of your essay and paste it in at a different point. Or you can use undo to delete your typing. Use these features and reduce the time you spend on editing your essay. Learn how to use these features, if you are new to them, and practice speed typing at home. This is really essential in these days of email and text messaging, where most of the younger population use chat language and shortened forms of words like lyk, hw, wat, imma etc. While this form of English is of no good anywhere in your life, it is especially frowned upon by the GRE community. So, if you find yourself using these sort of words in your essay, which has often happened in the past with many students, you will see your score go down suddenly and rapidly. So, it wouldn’t hurt to do a little typing practice at home before test day. So, those are the seven major factors that help you boost your essay score on the GRE. You should analyze your AWA essays whenever you take a practice test, and see if your essays have all of these. Here we discuss the step by step process you should implement, if you want to write powerful AWA essays in under 30 minutes and get a 6.0 score. Each of these steps discusses what you should exactly do, so as to make things easier for you on test day. All you need to do is follow these steps during practice, and get these tips into your head without much effort. Though the Issue and Argument Essays are quite similar when it comes to answering, we have given you separate step by step process to ace them both. The Analysis of an Issue essay tests your ability to “explore the complexities of an issue or opinion and, if appropriate, to take a position that is informed by your understanding of those complexities.” What this means is you should properly analyze the given issue and take a strong position: either negative or positive, and then elucidate examples as to why you have chosen that particular side. Before you begin writing your response, you should take a couple of minutes to think about the issue and plan a proper response before you begin writing. This helps you organize your ideas and develop them fully. Make sure to leave sufficient time to reread your response and make any revisions that you think necessary. Following are the six simple steps that you should follow in the same order, if you want to pen down a powerful AWA Issue essay. Obviously, this must be your first step. But you don’t just read the essay. You must perform a ‘smart read’. A smart read is where you read the prompt and figure out the central issue, and jot down this issue on your scratch paper, including some of the important concepts from the given topic. This is what more than 95% of students fail to do. Rather than juggling all your thoughts inside your mind, it is a lot easier to pen down whatever you have understood from reading the prompt in your own words. Your work on this first step gets you grounded for the essay ahead. After reading the given issue, and writing it down in a few concise words, you should be able to understand exactly what the issue is and also what some of the crucial concepts related to that issue are. This is perhaps the most crucial step of all, and this step is also where most of the heavy lifting gets done. Once you know what points you want to prove and what examples you will use to prove that point, writing the essay will be very easy. Half of the duty lies in brainstorming efficient examples and supporting reasons to supplement your point of view. So, make sure you spend adequate time on this step. Pre-planning before you start writing is of the utmost importance, because then, you will have a continuous flow of thought while writing, and there won’t be any wastage of time. If you start writing without thinking through the issue or planning the structure of your essay, you run the risk of wasting time on editing and re-editing your points. Or even worse, you might reach a dead end and there is no more evidence left with you to substantiate your point of view, but you’ve already spent 20 minutes on the essay that you cannot go back and write a fresh piece. So, it is important that you take the time to brainstorm some examples and then pick a side. After you’ve written down the central issue and the key concepts, you should ideally make a “pro” and “con” list on the scratch paper. Start thinking of reasons for both agreeing with and disagreeing with the given issue. Once you have enough reasons to pick a side, you can move further. You should think about how your personal experiences relate to the issue at hand. Think about things you have observed or experienced in daily life, read about in magazines or newspapers, or even heard about from your family members and friends. Next, you should be coming up with some examples of your own, that support or illustrate your point of view. Good supporting examples can be the difference between a score of 4.0 and 6.0, so it is worth spending a little time trying to generate them. Don’t spend more than two or three minutes on this part because you can still write a good essay without perfect examples. After you have some reasons and examples for side that you have chosen to go with, you will have to pick a proper thesis based on which you will write your opinion. This is because you don’t have to actually believe the position you write about; sometimes, you may disagree with the issue at hand, but find it easier to come up with examples and reasons for the other side of the argument. So, you need to decide which thesis you are comfortable writing about. Don’t mull over it for minutes together. Just choose whichever thesis allows you to write the strongest essay. In most cases, you find the “con” side easier to argue. You can find a lot of examples that way. And that is completely fine. Now your thesis needs to state why you believe this position is correct. Take a moment to think about this, and jot your thesis down on your scratch paper. Now you are ready to outline you essay. Don’t start writing your essay altogether. Instead, outline your essay in the direction you want to take. Figure out what you want to write in the introduction, how you want to start off, and how you want to end the conclusion. Then, figure out what you want to write in the body paragraphs. More importantly, you will have to consider how to introduce the opposing side of the argument and how counter it with your point of view. Mentioning the other side of the coin makes the graders think that you are mature enough to have considered the various perspectives on the issue, without going ahead blindly based on intuition. This structure allows you to take a neutral step, and hence interweave the arguments for both sides, just like in a debate. This structure is probably the hardest of all, but has the advantage of being new and uncommon. Graders will definitely appreciate a new structure once in a while, and tend to reward essays that move beyond the norm. But, the point is, the writing part of the essay should really be the easiest part. Most people who think they have trouble writing actually don’t have difficulty with writing, but they have trouble figuring out what exactly they are trying to say. So if you’ve completed the previous steps, you should know more or less what it is that you want to say about the topic. Proofreading is another step that is often neglected, mainly because test takers don’t have the time to. They think they cannot afford to waste one or two minutes proofreading the essay, while they can use the same time to write an additional sentence or two. But as a matter of fact, a perfect 400 word essay gets a higher score than an imperfect 450 word essay. So, you should rather focus on improving what you have already written, and try to spend at least three to four minutes on proofreading what you have written. Since you don’t have a spell checker on the AWA, you don’t know if you misspelled any word in a hurry. So, be sure to check every single word, and try to refine your essay as much as you can, before the time runs out. Make sure you have all the necessary parts of your essay and the examples you meant to use. Doing these things will clean up the overall appearance of your essay and can only positively affect your score. There are two key points in these directions; “evaluate the argument,” and most importantly (it’s so important the directions place it in italics), “do not present your own views on the subject!” Some test takers end up basically writing an analysis of an issue essay when they are supposed to be writing an analysis of an argument essay. Your job here is simply to evaluate and critique the argument presented, not offer your own position on the subject. If you do not answer the question appropriately, you can say goodbye to a good score. The Analysis of an Argument task presents you with a passage exactly like the passages found on Critical Reasoning questions. Your first task is to break the argument down into its conclusion and premises. Once you have the conclusion and the premises, the next step is to find the assumptions underlying the argument. These arguments are usually full of holes, even more so than Critical Reasoning arguments. You should be able to find two or three major assumptions necessary to make the conclusion work. Look for the common argument patterns: causal, sampling, and analogy. Of course, there may be a lot of assumptions spread around the entire argument, but you only need two or three good assumptions to construct your essay. Now that you have the major assumptions, you can plan the general format of your essay. Picking a thesis on the argument section is rather easy and involves just one step. Just assume that whatever assumptions that the author has made have no evidences, and go completely negative on that, and prepare a thesis in your mind in that direction. This is the most basic format for the argument essay, but feel free to make changes as and when you need. You may also use one of the following structures that are less commonly used. Detail first assumption; explain problems with it and how to weaken/strengthen the argument. Repeat the same for second assumption. Repeat the same for third assumption. Conclusion: Evaluate the strength of the argument based on the assumptions. The writing process on the argument essay is in some ways a little easier than that of the issue essay. Because the focus of this essay is the logic of the argument, there is no need for creative prose. Instead, you are merely presenting the flaws of the given argument in an objective fashion. Your delivery on the argument essay can be straightforward and simple and you can still get a great score, provided your analysis is sound. Following is what each paragraph needs to contain. The conclusion paragraph of an argument essay doesn’t need to do much, but as with the issue essay, you need to have one. All you have to do is make a final evaluation of the soundness of the argument. Before you leave your essay, spend one or two minutes proofreading your essay. Make sure you have all the necessary parts of your essay and that your essay is free from grammatical and spelling errors. Correct any typographical errors. Doing these things will clean up the overall appearance of your essay and can only positively affect your score. Now that you know how exactly you should structure your AWA essays, it is time to understand what a perfect essay looks like. In this chapter, we will discuss a couple of examples for perfect 6.0 Argument and Issue essays, and we will also analyze the reasons these essays deserve a perfect score. This will give you a basic idea of the various key aspects of the AWA essays that you should include while writing. These essays have been taken from the ETS Essay Pool itself. Be wary of these 6 types of false reasoning traps on the Argument Essay, and getting a 6.0 score will be a cakewalk. Creating stereotypes. Assuming that characteristics of a group in general apply to each member of that group. Almost all of the argument essays contain more than one of the following flaws, so it is important that you are aware of each and every possible flawed reasoning. For example, saying that ‘Girls are weaker than guys’ or that ‘Asians are geniuses’ is just plain wrong, because in both the cases, the statements are generalized in nature. While both the statements can seem to be true for the most part, we all know that in the real world, some girls are stronger than guys, and that some Asians fail their tests. Which means, one cannot simply make a sweeping statement in either of the aforementioned cases. Now, you can easily remember this type of false reasoning on the AWA, by relating it to stereotypes. We generally think of stereotypes as harmful because they unfairly limit a certain group to a predefined characteristic that often has little to no evidence. Hence, in order to avoid falling trap to this stereotypical assumption fallacy, you should immediately consider any sentence that generalizes a particular group as plain wrong, and attack that assumption when you are writing your response. Now, this looks like a perfectly logical statement to anyone. But the problem is, the author has not considered whether there are any other ways students can perform better in schools. The author makes a simple statement that outlines only one necessity – the teachers being active – and does not talk about the relevant evidences, or the possibility of other ways to achieve the same result. Of course, there are other factors involved: maybe students can perform better if they study every day at home, or if the school redesigns the curriculum to suit the needs of students, etc. So, you should keep in mind to attack this necessity assumption, and also to include the alternative factors or possibilities. Analogy is when someone comes to a conclusion about something on the basis of another thing. For example, if a giant conglomerate has doubled its sales in the last one year because it had spent over $10 million on advertising, then in order for another giant conglomerate to double its sales, it has to spend more than $10 million on advertising. Now, on the first glance, this might seem like a logical argument. But, if you think about it carefully, it is an illogical analogy that the author has made in order to prove his/her point. The argument may seem sound enough to agree to, but one simply can’t analogize these two scenarios, even though the size of the companies is similar. First of all, we don’t know if the two companies are based in the same country or not. The demographics in their respective countries may respond to different incentives. And there are several other factors like industry, market size, product quality, support system, target audience, consumer trends, economic situation in the country, etc., that need to be addressed, before the author can make such a comparison. Without this thorough background info, one simply can’t make this analogy, and test takers should hence not fall into such traps. As confusing and bemusing as the title is, this is one of the more frequent fallacies that appear on the AWA argument essays. More famously known as the post hoc fallacy, this is easily one of the most common types of false reasoning you’ll encounter on test day. So it is very important that you master it. Many arguments try to confuse test takers by arguing that correlation and causation are one and the same. But in fact, they aren’t. There is actually a world of difference between them both. While correlation just means that two events have occurred simultaneously, causation means that one event is the result of another event. Now you understand how different these two are. To illustrate further, let us take this as an example: In the year 2000, Company X released their new computer called Series 5, and that same year, the US witnessed a huge economic recession. Again in 2008, the company released its second computer called Series 6, and the US had undergone another economic recession. So, whenever this company releases a new computer, the economy goes down. Do you see how illogical it sounds? That is the difference between correlation and causation. The above example shows correlation, and not causation. So, one should be careful enough to understand that just because one event happens after another, it doesn’t mean that the first event caused the other to occur. You will often find that the AWA arguments cite statistical evidence to support their claims. Now, while we appreciate any kind of statistical data that further bolsters the author’s point of view, we must also be careful to analyze the relevance of the statistical data in a particular scenario. Sometimes, the argument may cite a statistic according to a survey where a small group of people were asked a question, and based on their views, the author generalized the opinion of the people of the entire city/state/country. For example, if a survey of 1000 people in New York City say that they really need a new park in the city, does it mean that the entire population of the city feel the same? In order to draw a conclusion about anything, a larger sample is required. In order to really identify the voice of the people, the survey should at least include a majority of people in the city. If the population of New York City is 10 million, then the survey should try to include the opinions of at least half that number. Hence, test takers should keep an eye on statistics mentioned in the arguments made by the author, and try to validate the relevance or significance of the given statistical data. Sometimes, even though surveys include a large number of people or a certainly large sample space, it is not enough to conclude that the results obtained from the survey are really true. Biased data is another reason why data can be manipulated with, or tainted easily. For any survey or data to be considered legitimate it has to be collected in an unbiased, fair, and scientific manner. For example, if a survey was conducted among children in a city, on the question “What is your favorite color?” and the children were given only two options, Blue and Red, one cannot conclude that Red is the most favorite color for the children in the city, even though 83% of the children chose Red. The survey clearly does not ask an open ended question, and is biased towards either Red, or Blue, or both. The survey is designed, consciously or unconsciously, to yield certain desired responses, and this definitely manipulates responses by providing narrow options. Hence, test takers should question the statistical legitimacy of a survey, and question the author whether the survey or data obtained is scientific and unbiased or not. Here is a checklist you should use when you practice writing argument essays. Ask yourself these questions to identify the flaws in the given argument. If the argument draws conclusions from any sample statistical data, then is the connection between the data and the conclusion strong? Is the sample data taken from the group similar to the other group for which the conclusions were made? Is the sample data significant enough? Is the provided sample data inconclusive or invalid? Did it exclude other important factors? Are the statements mentioned in the argument from an authority on the subject or from individuals trying to voice their concerns/opinions? Is there anything missing in the argument? Maybe there is really something that should have been mentioned to make the argument more concrete. Sit back, relax and watch as others end up with unfinished essays. Learn these effective time management strategies and finish off your essay in 20 minutes. When it comes to acing any section on the GRE, it all boils down to mastering one key factor – time. Time is the only reason why 99% of the test takers cannot get a perfect score on the GRE, let alone on the AWA. But then, just as pretty much with everything related to the GRE, we at CrunchPrep have cracked the code in order to finish off a brilliantly written essay in under 20 minutes. That’s right, 20 minutes only. Just as with other sections on the GRE, there are a few time saving strategies that you can adopt on test day, if you want to finish off the AWA section quickly, and still score a perfect 6.0. Here are the 9 most effective time saving strategies that you should implement on test day. This is an amazing technique that not only saves time for you, but also relieves you of the pressure of writing something in reply. All you have to do is, as soon as you are ready to pen down your response, finish off writing the introduction and the conclusion paragraphs first. Don’t bother touching the other paragraphs yet. Now you may wonder, how on earth one can write the conclusion part without ever concluding the essay in the first place. Simple. As we have already discussed in the previous chapters, you first outline your essay before you start writing it. So, by the time you are about to start penning down your response, you will have already figured out what you want to write in the introduction, how you want to start off, and how you want to end the conclusion. So, it becomes rather easy for you to get started. Finish these two very important paragraphs as early as you can, preferably in the first 5 minutes. Now, if you can do this well, you only have three more paragraphs to write, and you have over 20 minutes of time left. You can easily write each paragraph in 5 minutes, and the entire essay will be finished before you know it. Even though we asked you to pick a thesis in the previous chapters, you should know that if you want to save time, you will have to try and stay on the negative side. This applies to both the Issue and the Argument essays. If you are wondering why, you should understand how the human brain works when analyzing a controversy. It takes no time for us to point out mistakes in others, while it takes a lot of thinking and courage to appreciate something that is controversial, because our brains are evolutionarily hardwired to stay away from something foreign, in order to protect us. And given the incredibly limited time that you have on your hands, it will be easier for you to criticize the author’s point of view, than to take his/her side. So, let us go with some prejudice here. Before you even start reading the essay question, you should be in a negative state of mind, and be ready to counter the given essay with lots of criticism. You should believe that whatever the author has written is false, no matter how logical it may seem. This sort of thinking will help you brainstorm the relevant points quickly. In both the Issue and the Argument essay questions, the author will have made multiple assumptions in order to come to a particular conclusion. It is your job now to attack the very assumption that the author makes. There is no point in attacking mere facts, because we never know if the facts are true or false. Which means, you cannot simply claim that the facts presented are wrong. But you can always say that the assumption is wrong. So, as soon as you start reading the essay question, figure out where the author has made assumptions, and think about how you can attack them. This is a big problem among students today, especially those who really want to get a perfect 6.0 score. Wanting a 6.0 score is okay, but the problem is, these students try to be perfectionists about everything they write. They try to make sure every little thing about their essay response is perfect. Now, while this is a good practice in normal life, you should remember that this will hit you badly on test day. You cannot simply make sure everything you write is perfect, especially when the clock is running after you, and when you are totally stressed out. A better strategy is to keep writing even though you make mistakes, as once you think you are done with the writing part, then you can start proofreading your copy for mistakes and small errors. One of the biggest sins that GRE test takers commit, is that they don’t use the scratch paper to its fullest. Don’t be under the impression that the scratch paper is given only to help you solve quant problems. The scratch paper can be used effectively to score higher on the AWA section too. Use the scratch paper to pen down your thoughts as you are reading the given topic, and also make use of it to outline your essay, and to devise a proper answering strategy. If you need more details, on how to use the scratch paper on the GRE, we have done a separate post on that. Check out more scratch paper tips and strategies here. If there is one thing that can help you write a 500-600 word essay in under 20 minutes, it is the ability to type fast. Considering the fact that you will take about 2-3 minutes to read and understand the given question, another 2-3 minutes to figure out what you want to write, and another couple of minutes to outline your essay, you will be left with roughly 20 minutes to write a 600 word essay. Considering the fact that you should save some time to proofread your essay, you should probably be able to type around 600 words in 15 minutes, which means, 200 words every 5 minutes. Yes, it is possible to type a couple hundred words in 5 minutes, if you already know what you are going to write. Don’t worry about it. 200 words in 5 minutes equals 40 words per minute, which is exactly the global average for typing speed. But still, if you think you can’t type that fast, start practicing today. There are some fantastic free resources like Keybr and TypingWeb available online, that help you learn fast typing. Learning keyboard shortcuts can be really helpful on test day. The word processor on the GRE is quite basic in nature. You’ll have basic keyboard functions, plus three other features: cut, copy, paste, and undo. And that’s all. No other shortcuts or spell checks or other advanced features like bold and underline. Now, these functions work exactly as they do on your computer. You can cut text from a portion of your essay and paste it in at a different point. Or you can use undo (Ctrl + Z) to delete your previous typing. Use these features and reduce the time you spend on editing your essay. As straightforward as it gets. Just as with the other sections on the GRE, the more you practice writing long essays at home, the higher you score on test day. But there is a catch here: you should practice typing essays on a computer keyboard. This is rather important, because most of us today use laptops and tablet phones to communicate, and the keyboards we normally use differ greatly from those of the desktop computers. You will have to type on a desktop computer keyboard on test day, and it is recommended that you get used to the new keyboard at home itself. We generally don’t recommend this to every student, since most of them don’t have the time to. But if your test is months away from now, it will do you a world of good if you can go through each and every AWA question from the ETS Essay Pool. There are separate question pools for Issue Essays and Argument Essays, and they are not too many in number. You could probably finish them all in a month or two. Remember that the AWA questions you will see on test day will be from these essay pools only. So, it won’t hurt to check them all out. Turn your average essay into a phenomenal piece of literature with these top transitional words. Use these words and phrases and your essay will read like a great story. Better safe than sorry. Learning where you can falter will help you be aware. Avoiding these 27 mistakes will help you get a higher score on the AWA section. Until now, we have discussed numerous techniques and strategies to score a perfect 6.0 on the AWA section. But, we think it would be beneficial if you have all the probable mistakes at one place, so you can safely avoid them all at once. Here are the 27 mistakes that you should strictly avoid while writing your AWA essays. Now, some of these points may sound repetitive since we have already discussed a lot up until now, but think of this as a checklist that can help you figure out the danger zones and possible pitfalls. While using cliché phrases and sentences may seem like an idea choice for anyone writing an essay, it would more often than not be detrimental to someone writing the GRE. Understanding the fact that hundreds of thousands of students write the same essays every year, you should try and be a bit different, a bit unique. Using the same examples that everyone uses really won’t help you much, because it only looks like you have lifted those lines from someone else’s passage or an online journal. So, try to use your own examples, and your own sentences while writing the AWA essays. Sometimes, it would really help if you can use a killer essay quote or two, in your AWA essays. But it is important to remember that you should cite the original author, lest there is chance that you might come off as pretentious. Whenever you are quoting someone’s lines, it is customary to give them the credit. Doing this will not only reinforce your image as a trustworthy individual, but also gives the grader an impression that you are an intellectual person. After all, only uber-smart people can remember great quotes along with their authors’ names. If you remember what we discussed about writing and organization in the previous chapters, you should recollect the fact that you must allocate separate paragraphs for every idea or point that you are writing about. Often times, test takers tend to stuff a paragraph with two or three ideas, and end up mixing it up pretty badly. This can often cause confusion, not only to the grader, but also to you. Discussing more than one point in a single paragraph is not at all recommended. Dumping all ideas into a single paragraph is a very bad idea, and shows poor organization. So, make it a point to not mix up paragraphs. The most important aspect about writing an article or an essay is to avoid giving away too much information in the very beginning itself. Don’t believe us? Ask any content marketer. The key to writing exceptional essays is to keep the reader intrigued until the last word. This is one of the reasons why we hate our textbooks but love fiction novels: the latter simply keep you interested until the end. So, you might want to implement the same strategy when writing your essays. Do not give away too many key points, or at least your main idea, in the first paragraph itself. There are separate paragraph for that. Just as we already discussed multiple times throughout this guide, avoid using irrelevant examples as much as you can. Sometimes it is fine to make up your own examples, but remember that they should be very relevant to the rest of the essay. So, as much as you can, try and come up with strong and concrete examples to support your point of view. One of the more overlooked mistakes in writing is that many test takers tend to not summarize their essays properly. A perfect conclusion paragraph not only includes the main idea or point of view that you chose to side with, but also has a neat summary of all the points that have already been discussed in the previous paragraphs. Now, this doesn’t mean you need to write them all over again, but a quick conclusive line about each paragraph would do you a world of good. Yes, this happens quite often, and is one of the major reasons why many are not getting close to that perfect AWA score. Sometimes, you finish off writing the entire body of the essay, and move on to the conclusion paragraph. As you are writing it, you are struck with a new point or an idea that you think should be on the essay at all costs. So, what do you do? You somehow try to fit that point somewhere in the conclusion paragraph, and you think it will add to your existing robust set of points. But guess what? You haven’t backed it up properly anywhere in the essay, and hence the entire point sounds irrelevant or insufficient at that point of time. So, avoid introducing new ideas or points in the last paragraph. Be content with what you have already written. If you have read the previous chapters thoroughly, you would understand that there is a step by step process that you need to follow in order to get closer to the 6.0 score. But, a majority of the students give in to the temporal pressure, and start off writing as soon as they read the question. This will only lead to chaos in the next few minutes, as you will find your head clogged with ideas. So, give it a minute or two, and think about what you are going to write, before you start typing. A poorly presented idea is as good as an idea not presented at all. Whatever point it is that you are trying to make, you should make it correctly. An improper presentation, or a poorly organized idea will only make your essay sound more amateur that anything else. As straightforward as it can it, time is the most valuable resource on the GRE. Taking too much time just to gather ideas is not at all good for your score. Almost all the essays you will see on the GRE are quite simple to criticize, and anyone with decent practice can crack the code easily. So, in order to avoid wasting too much time trying to ideate, you should do a bit of practice at home. We’ve already said it out: Go negative! There is no way an average GRE test taker can write a perfectly balanced essay response in under 30 minutes, which is why most of them tend to sway towards a particular side. You should follow suit, if you want to score higher on the AWA section. Not sticking to any one of the sides shows that you are too afraid to stand your ground, or that you are too confused to pick a side. Neither of this is a good image for you, so always pick a side no matter what. There are a few basic structures for writing the AWA, and adopting them would be a good idea, since you don’t have to reinvent the wheel all over again. We have already done most of the hard work for you, and provided some basic structures and templates that you can easily follow. If you can’t make good use of them, at least try to create your own organization or structure. Otherwise, your essay response ends up being too clumsy to understand. Whichever side you choose to take, or whatever point you are trying to make, be specific. Never try to beat around the bush and expect to get away with. You are not a politician. Never use vague statements that only lead the grader to more confusion. Be very specific about your opinions, and have a clear idea of what exactly you are going to write, even if it might sound a bit negative, or a bit harsh on the author. To paraphrase Maya Angelou’s epic quote, ‘You should use a word only if you know what it exactly means.’ Keep this in mind at all times. Do not use a word just for the sake of using, and end up sounding like a novice writer who is trying to impress people he doesn’t know. Instead, use nice little words that sound simple and professional enough to get you a good score. Your essay should read like a story. Every paragraph that you write should have a smooth beginning and a smooth ending, thus making the entire essay readable. This can only happen when you use transitional words and phrases that are like bridges linking one paragraph with another. Not using transitional words can make your prompt sound abrupt and hence, not perfect. Whether it is an Issue essay or an Argument essay, you are asked to give your opinion. Which means, you are entitled to write whatever it is that you have in mind. Nobody is going to argue, or disagree with you, so there is no need to get defensive at all. Using words such as ‘I think’, ‘in my opinion’, ‘perhaps’, ‘Maybe’, etc., will give the reader the impression that you are not confident enough to put your ideas forth. So, be more confident, and more authoritative when you are writing your opinions. Write like an expert editor of a newspaper, not like a newly recruited intern. While it is perfectly alright to sound like an expert, it is not alright to sound narcissistic and repetitive. A lot of students use the word ‘I’ way too often that it puts the reader off. Yes, everybody already knows that it is you who wrote the essay and that all the ideas presented in the essay are yours. There is no point in saying ‘I think this’, or ‘I would do that’ etc. A few times is fine, but too many times isn’t welcome at all. If you remember what we said earlier, sentence variety is as important as anything else. Using monotonous sentence structures or repetitive phrases throughout the essay is a pretty bad idea, since it tells the reader that you, as a writer, lack variety, or creativity. So, try to rephrase the same sentences and write something else that means the same. Like many other things in life, this comes with a lot of practice. Agreeing with the author to some extent will give the grader a great impression about you as a writer, but if you keep on agreeing with the author’s points of view, without including any new information from your side, you will surely come off as someone without any knowledge about the given subject. Given the fact that almost all essays come from a wide range of topics, and that they don’t need any special prior knowledge, it would be bad if you cannot counter the author’s deliberately wrong point of view along with your two cents. With so many arguments and counter arguments clogged inside your mind, and with the speeding clock on the screen, it is possible that you somehow contradict your own argument. Sometimes, when writing the third or the fourth paragraphs, test takers contradict their own opinions or points of view that they put forward in the first one or two paragraphs. This clearly shows that you get confused easily. So, don’t contradict your own statements, and always read what you have written. Writer’s block is when an author loses the ability to write something new. This has happened to the greatest of writers, and will probably happen to you too, if you don’t practice well enough before the test. If you are someone who is not used to writing a lot, then should start practicing for the AWA, unless you want to end up staring at the screen pondering how to begin the essay. Also you already know, you will face the AWA section first. Don’t let the AWA section set the tone for the rest of the test. Sometimes AWA goes great, and you’ll feel extremely confident (or overconfident) about the remaining sections. Sometimes, you may not do well on the AWA and feel gusted about yourself, which affects the other sections. So, try to stay unaffected by the result. Remember; you are the one who sets the tone, not a couple of essay questions. Even though grammar and vocabulary are really important when it comes to scoring higher on the AWA, you should not overstress their importance. Write whatever you can and as much as you can. Do not bother about silly grammatical errors or workaday vocabulary. Once you think you are done with writing, then go back and read everything, correct those grammatical mistakes, or replace those boring words with good vocabulary. But, do it only once you are done with the essay. Mark Twain once said ‘If I had more time, I would have written a shorter letter.’ That shows how difficult it is to write short and concise sentences. Anybody can write long gibberish in a short time, but it takes lots of practice, time and talent to keep it simple. Now, even though you are not blessed with a lot of time during the GRE test, you should try to minimize your sentences to make them sound smarter. Don’t try to use filler words or phrases so you could increase the word count. Quality trumps quantity any day. Writing as if you are chatting with a friend is something that happens quite often during exams. Using chat language and shortened forms of words like u, hw, y, etc. is bound to happen, especially if you are not very adept at writing often. If however, you find yourself using these sort of words in your essay, your chances of getting a good AWA score will rapidly decrease. So, it wouldn’t hurt to do a bit of practice at home before test day. Or vice versa. It is possible to get confused between an issue essay and an argument and test takers often mistake one for the other. This could be the gravest mistake you will ever make on the AWA section, because if you cannot understand whether the given question is an Issue or an Argument task, then you cannot write a proper response at all. So, make sure you don’t get confused between the two essay formats or structures, and that you have a clear understanding of both the question types. Proofreading is often neglected because test takers simply don’t have the time. They think they cannot afford to waste one or two minutes proofreading the essay, while they can use the same time to write an additional sentence or two. But as a matter of fact, a perfect 400 word essay gets a higher score than an imperfect 450 word essay. So, you should rather focus on improving what you have already written, and try to spend at least three to four minutes on proofreading what you have written. So, this is the most comprehensive list of mistakes that you can avoid on the AWA section of the GRE. With this, we come to the end of this ultimate guide. And if this were any other guide, we would have finished it here. But since this is an advanced guide for the AWA, we would like to give you something special. Something that is exclusive to only you. In our bonus chapter, we would like to give you a bonus: A couple of super-secret templates that you can use, if you want to speed up your AWA preparation. The advanced AWA Essay templates you will ever find on the internet. These AWA templates are designed to give you an unfair advantage on test day. This bonus chapter includes mind boggling AWA Essay templates that will get you a sure shot 6.0 score. We have created these templates after examining several hundreds of AWA essays and responses from students across the world. This chapter contains both AWA Issue Essay Template and AWA Argument Essay Template separately. Using these templates will get you guaranteed results, and you will see a perfect 6.0 score on your own essays, guaranteed. NOTE: But wait! Just because we have given you a couple of templates, it doesn’t mean that you just copy the same content during your actual GRE test. Remember, this website gets thousands of visitors every day, and if every single one of you use the same template, very soon, all your AWA scores will be cancelled and your essay response will be held for plagiarism. We definitely don’t want that to happen, do we? So, better be careful. We strongly advise you to use these templates as frameworks, and use them to create your own templates for both the essay questions. The templates provided here are just for reference, and it will only help you if you create similar templates for yourself, rather than using the ones given here. Download the AWA essay template right now! So, that’s about it. We have come to an end of this epic guide to ace the analytical writing section on the GRE. We have discussed about 71 invaluable strategies that you could use to improve your writing skills, and thereby get a perfect score on the AWA section. This is by far the most comprehensive GRE Analytical Writing guide in the world. It was created to help you ace the Analytical Writing section in the GRE. If you think this is very helpful, or if you really loved it, share it with your friends right now! Our goal is to help as many students as we can. So what are you waiting for? Go share or tweet the living daylights out of this guide! I Want Free AWA Templates Now!